A quick escape to somewhere exotic in the world is high on the list of "great ways to relax." Make your destination Ibiza, factor in live music and wellness activities in a unique Ibiza event, and you’ll soon realise that life is good! Ibiza played host to Prem Joshua & Band again this year for a one off performance, followed by a special retreat day in the grounds of the Atzaró Rural Hotel. The My Guide team went along to his most interesting of Ibiza events to find out what makes this renowned artist and his band so beloved on Ibiza and around the world. The secret lies in the fusion of traditional Indian music with contemporary Western sounds. This music transports you effortlessly from lounge sounds you can meditate to all the way to foot stomping, arm waving and wild cheering as the beats carry you on a wave of sound. Shiva Moon, a big hit for the band, was clearly a favourite of the crowd with the band drawing three encores and cheers for Prem and the band to unleash more of their fiery rhythms and energetic grooves. Who knew the sitar could wield such power to get us up and dancing? Opening act dancer Zinnia Gupte was followed by a wonderful performance by Indian dancer Hina Sarojini; more about that later. 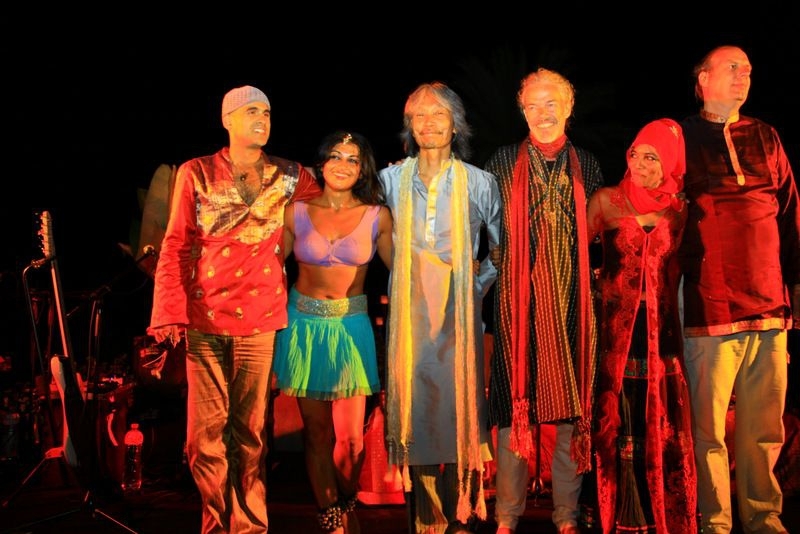 It is not often we find such a diversity of Ibiza activities supported by a band and their music. This was an opportunity to fuse entertainment with yoga, silence with an explosion of sound and high energy movement with frozen motion allowing all to draw tremendous amounts of energy from the day. The Prem Joshua Band is made up of members from around the globe and often features special guest performers who make an incredible show even more entertaining. 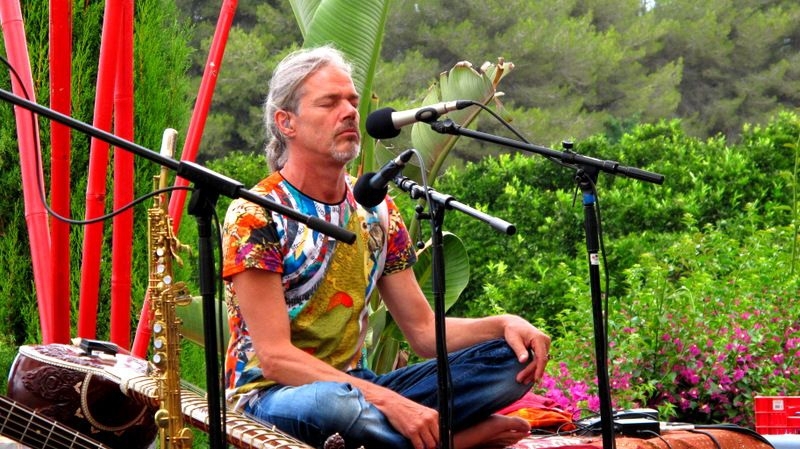 On sitar, bamboo flute, sax, vocals & dilruba is Prem Joshua himself from Germany. Playing the tabla, Darbukka, percussion & also a vocalist is Raul Sengupta from India. 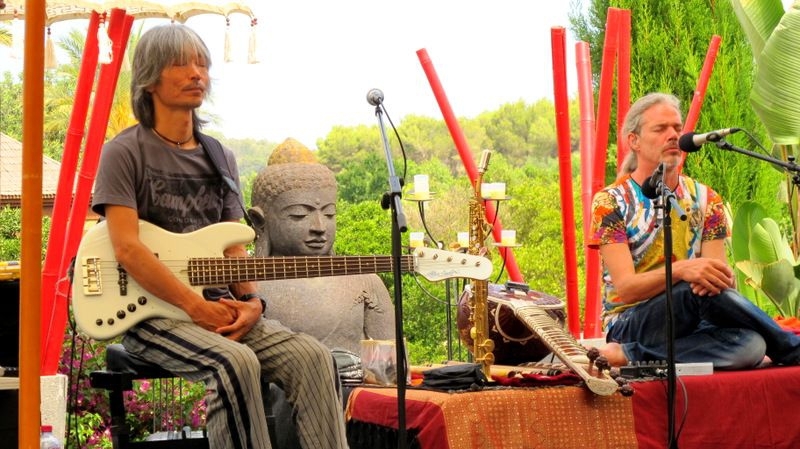 On the electronic keyboards, percussion & vocals is Chintan Relenberg from Germany and the Japanese percussionist & bass player is Satgyan Fukuda. The very special featured performer on the night of the concert was Hina Sarojini, who also joined in the activities and shared her Indian dance moves and skills with the group in an elegant display that had everyone in stitches! Lessons to be learned here, apart from rhythmic movement and grace, were that "where the hands go, the eyes follow..." All of these were greeted by a lot more laughter as everyone was taught how to impersonate a fish using only hand gestures! What would a day of mental release be without Nataraj? This we learned is another form of dance; a 1hr dance meditation, with 45 minutes of improvised high energy music, followed by 15 minutes of silence. Dance meditation, Satsang, an energy breakfast and of course a very healthy lunch were among other activities throughout the day. All in all, the perfect Ibiza escape for the mind, body and soul. If you are still finding it hard to imagine what the Prem Joshua experience is all about then the best thing to do is to come along to the next production. Prem Joshua and the Band will be returning to Ibiza and the My Guide team are already working on planning the next show. Visit our Fan page to see the beautiful photos & updates. Around Ibiza in 10 beers!